Public Access to Your Personal Information. You do not need to provide personal information about yourself in order to use this county Web site. If you choose to provide us with personal information about yourself in an e-mail or by filling out a form with personal information and submitting it to us through this web site, we caution you that the law may consider that e-mail or information as a public or government record and require us to comply with lawful demands for public access to it. We will not provide any personal information about you to any third party except as required by law. Security. Although the Morris County Municipal Utilities Authority has taken security precautions to safeguard the security of data in this Web site, we caution you that e-mail on the Internet is often insecure and subject to eavesdropping, and it is not possible to achieve perfect security protection for information maintained in a Web site. Accordingly, we cannot assure you that the security measures we have taken will always prove successful. By your use of this Web site, you accept this risk. Disclaimer - Endorsements. Reference in this Web site to any specific commercial products, processes or services, or the use of any trade, firm, or corporation name is for the information and convenience of the public, and does not constitute endorsement, recommendation or favoring by the Morris County Municipal utilities Authority, or its offices, employees and agents. Disclaimer - Links to other Web sites. This Web site contains links to other web sites which are not owned, operated, controlled, or reviewed by the Morris County Municipal Utilities Authority. 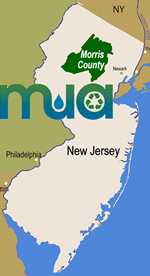 When you link to one of these sites, you are no longer on the Morris County Municipal Utilities Authority Web site, and we disclaim any liability or obligation to you or any other person that may result from your access to or reliance upon any information contained in these Web sites, including any alleged infringement of copyright or trademark. When you link to another Web site, you are subject to the legal terms and privacy rules of that new web site.